A first-rate charmer with a devilish twinkle in his eye, Billy MacKenzie was a maverick figure within the music industry whose wild and mischievous spirit possibly did him more harm than good. As frontman of the Associates, gifted with an otherwordly, octave-scaling operatic voice, MacKenzie, together with partner Alan Rankine, enjoyed Top Twenty chart success in 1982. At the height of their success, however, they split. Over the ensuing years, MacKenzie gained a reputation for his unhinged career tactics, generous spirit and knack for squandering large amounts of record-company money. Born in Dundee in 1957 he was the eldest son in a large Catholic family. He was bullied at school and sought refuge in music. 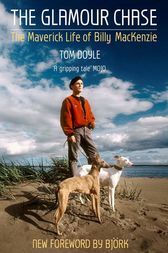 He was a schemer and dreamer, a breeder of whippets and a bisexual who kept quiet about his private life. During his lifetime, his unique vocal gift attracted the attention of Shirley Bassey, Annie Lennox and Bjork. However, in the tradition of Scott Walker, Syd Barrett and Nick Drake, MacKenzie's tale is one of thwarted talent and, ultimately, tragedy. He was found dead, aged 39, at his father's home in Scotland, on 22 January 1997, having taken an overdose.